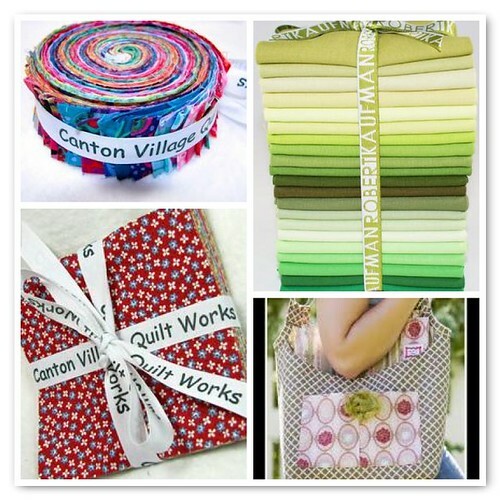 Amy's Creative Side: Canton Village Quilt Works - Giveaway! Canton Village Quilt Works - Giveaway! Hi my name is Jackie and I am the owner of Canton Village Quilt Works. My quilting career really started back in 6th grade (long ago) in Home Economics. I made a patchwork pillow, which I still have, but that was the extent of the quilting. At that time, I loved to make clothing. But no longer do, because I totally and passionately love quilting. Anyway, I did go and take my first quilting class and did not immediately fall in love. But after the second one I was hooked. Eventually, when both kids were in school full time, I started my long arm quilting business in the year 2000. So, wow, 10 years ago! Hubby being skeptical and thinking that myself and his sister were the only ones in the universe who quilted, wondered out loud, “how long will this business last”. I think now my husband has been enlightened. In the fall of 2008, at Quilt Market, I invested in the AccuQuilt Studio Cutter. It has helped me tremendously in becoming more efficient. More recently, it has allowed me to sell accurately die cut fabric to my customers. I first started to sell my die cuts through Etsy and was successful at doing so. When I went to quilt market in the fall of 2009, the plan was to invest in fabric to sell yardage and die cuts. I then opened a full-fledged online quilting shop!! I stock Westminster Fabrics (Kaffe, Brandon, Philip, and Martha), Robert Kaufman (Kona Cottons, and Essex Linen/Cotton Blends), Marcus Brothers (Aunt Grace Repros), Izzy and Ivy Designs Patterns, and Die Cuts, Pre-cuts, and Bundles, and Quilt Kits. This has been a wonderful addition to my long arm quilting business. I continue to quilt customers quilt tops and offer edge to edge quilting, semi custom, and custom quilting. I love doing this and will never give this up. My customers are a constant source of inspiration. I wanted to give back to my customers and now have a Frequent Quilter Club Card which they use to receive discounts on Edge To Edge Quilting. I want to thank Amy for offering me this opportunity for you to get to know me a little better. And to thank all of you who come to visit me on my blog and listen to my ramblings. So onto a wonderful giveaway! 1. Comment on Amy’s post here. 2. Visit my blog and become a follower, then let Amy know in another comment that you did so. If you are already a follower, just let her know in a separate comment. 3. Go to my blog and sign up for e-mailings for Special Discounts and Happenings At Our Online Fabric Shop. Then come back and tell Amy. 4. Visit my online shop and come back and tell Amy which is your favorite product. This will give you 4 chances to win!! When you stop by my blog, don’t forget to say Hi!! And thanks for joining in the fun! Amy again :) I love each of the prizes myself! That stack of green is so springy! I've added numbers to the comments and rely on them to find the corresponding winner from the random number generator, please be sure to add a comment for each of your entries to have it counted! I will select winners on Monday, February 22 ~ Good Luck! Ive never been first to comment (almost) on a giveaway before. i love this giveaway, beautiful prices. Hope Im lucky this time! Im also on the mailinglist on her blog. Lovely to see Jackie featured here Amy ! Thanks for the interview! I am allready a follower of Jackie's blog. I am signed up too on the newletter. So many great things to choose from.....I'd go with anything Kaffe Fassett, love the colors!! Thanks for the great giveaway gals!! Wow. How much would it cost to have a twin size quilt quilted? Gorgeous Colours & Fabrics so enjoyed the Interview with Jackie ! In the shop I of course LOVE all the Kaffe's! But I also have been eyeing the bag patterns and have got the first one with the bow and the diaper bag on my wishlist! Now A Subscriber to Jackie's Newsletter too ! OOoh!!! I would love to enter! I am already subscribed to Jackie's newsletter. I would have to say that my favorite product/item at the moment is the Essex line cotton mix. I am a follower of Jackie's and have been for some time. my on line favorites in Jackie's shop are the fat quarter bundles of Kona Cotton. Great stuff! Jackie's living the dream-hobby and passion and gainful employment! What a nice giveaway. I read & enjoy both your blogs. I just signed up & confirmed for the email list! Now this is a hard one. To pick just 1? The 30's repros or maybe the Kaffe or the Kona? Not sure 1's enough!! Love the red fassett fat quarter pack! Thanks for hosting another great giveaway Amy! I already get Jackie's newsletter too! Thanks for hosting a great giveaway! I already follow Jackie's blog! I drool over Jackie's precuts on a regular basis. Much as I love the Kona solids packs, my heart just leaps at the thought of a Kaffe tumbler quilt! Favorite item from Jackie's online store... The Nicole bag pattern. I love it! Great bag for travel. I love all the great prizes! I have her site on my sidebar already and visit whenever I can. I enjoyed the post and am going to Jackie's blog right now. THANKS!! Wonderful giveaway! I'm off to browse the website. Looks like it will be fun! My favorite items in her shop are all the delicious Kona cotton packs and rolls. I'm really wanting to play around with solids this year and am trying to build my stash. I also love her tumbler die cut fabrics! Congrats on passing the 200th post! Great giveaway. I am a subscriber to the newsletter. I checked out the shop and love the Purple People eater collection! Purple is my fav color. I am so glad that I checked out the online store..I love 30's fabrics and the AUNT GRACE jelly rolls and FQ collections are amazing. I signed up to follow Jackie's Blog - I am so glad that you did this, Amy, or I would not have know about Jackie's online store. LOVE IT. Wow, those are delicious colors! What a nice giveaway. I'm already a follower of Jackie's blog. I signed up for the online store discounts and mailings ... looking forward to it! Yeah! I love me some Jackie and CVQW. Wow Amy you sure are having some sweet giveaways! Thanks for entering me. I subscribe to Jackie's blog. And I already am a follower of Jackie's blog. I am subscribed to Jackie's e-mail newsletters. I have bought many things from Jackie and have never been dissapointed but my favorite are the Kaffe Fassett prints. Thanks for hosting this giveaway! I love reading Jackie's posts! I'm already on Jackie's email list. I love the die cut 30s repro tumbler blocks! I even own some! Thanks for hosting Jackies giveaway. Jackie says HI! And that green pastures bundle is so happy. Green is a great color! Also, I am a follower of Canton Village Quilts blog! I signed up for the sales and specials emails. Wowee! Love that green FQ bundle! Count me in. I get the newsletter too. I love all the Kaffe Fassett fabrics. If I have to pick I suppose the "Kaffe Fassett Fat Quarter Collection This fat quarter pack contains 33 different Kaffe Fassett Collective Fabrics" is my favorite. Kaffe Fassett Green Fat Quarter Pack. Great giveaway! The fabrics look yummy. Great giveaway. thanks for the chance! I am a subscriber to Jackie's newsletter. I love it all, but I'd have to say my favorites are the Westminster fabrics. My most favorite are 30's reproduction fabrics. I don't use it as often as I used to but it's still my favorite. I was part of Jackie's Black and white challenge last year, where lots of lovely quilts were made. Thanks for the great giveaway. I just became a follower at Jackie's blog. Can't wait to go back and read more. Love the fabrics and I think it strengthens a stash when some fabrics are chosen by someone else! I'm already a follower of Jackie's blog! Wow...What a give away and what an accomplishment to be blogging so long. I've been big into solids lately, so I like the Kona cottons in your shop. Amy you've really picked a gem for your blog today!!! Jackie's blog is very fun to follow and she is so talented! What a great inspiration! Already a follower and love it! The Green Pastures Fat Quarter Bundle is my favorite! Such an awesome giveaway! I will definitely be checking out her blog and store!! I am signed up for the sales and specials emails. And I already am signed up for the emails. See, I already love her! I'm also a follower. thanks! I really like the Kona Cotton stack and the Aunt Grace Authentics. While I drool over everything in Jackie's shop, I absolutely love the Kaffe Fassett New Arrivals FQs. I love the Kona FQ bundles! Grounded and My Blue and Green Pastures~ oh my! :-) Having the whole range of colors at your fingertips would be so cool. Thanks for the wonderful giveaway! And as much as I love all the fabric in her shop, I usually go there to admire the quilting she does. Its fantastic! I do love anything cut into hexagons though, and I know she can do that with her AccuQuilt. And I'm now following Jackie! Such a great blog she has! This is such a fabulous giveaway! I really like the Aunt Grace fabrics- am doing a 30's jewel box now. I love precuts, and Amy's store has so many precuts!!! I especially love the circles, and of course the Kona cotton FQ bundles! My favorite thing on her shop, Kaffe Fassett Large Tumbler Blocks. Need to grab some of those. I already follow her fabulous and inspiring blog. And signed up on her email list! I receive her mailings as I am on her mailing list. Count me in please! Thank you for this wonderful giveaway! I just subscribed for email notifications from Jackie's shop. Wow, there's so much I want, I'm sorry I missed the Valentine specials. I have always been a fan of the 30 reproduction fabrics, but I would have to choose Kaffe Fassett's collection as my favorite item in her online store. My favorite thing in her store, of course, are the great Kona Solids!! Favourite things from Amy's online store... Kona cotton precuts!! Thanks to you and Jackie for this fun give away. I love the bundled Konas....it would be so nice to have ALL of them!! My favorite thing in Jackie's shop is all the Kaffe fabric. I have bought some from her and it is fabulous. What a shop!! I love it all. The Kaffe circles and tumblers will have to come live with me. But my favorites are the kona cotton fat quarter packs. OMG I want them all. I've been trying to concentrate on adding solids to my stash, and there they are!! Oops, I think I just drooled! Love this fabric! Amy said hello! I just signed up for her special emails for her fabric shop, because really, who doesn't like a deal thrown into her lap?? I am completely SMITTEN with her Aunt Grace Authentic 1930s Fat Quarter Collection...I am starting a dresden plate project in the next couple of weeks, and I think those fabrics would be so pretty! What a great giveaway! I love those greens, but really all of the four prizes that Jackie is giving away are wonderful. I love the die cut tumbler pieces. Cool idea!! Awesome Giveaway!!! thanks for the chance to win! what a fun give away. I would love to win. all signed up for the newsletter too! Wow! What an awesome give away! I love a quilt story where the husband is so supportive of this craft. I really enjoy Jackie's blog and love her die cuts. I am also a follower of Jackie's blog. I am also signed up for her emails. Love Jackie's store! Been buying way too much from her lately! Super fast shipping, and overall just a pleasure to do business with! My favorite at Jackie's store is the Kaffe blue fat quarters and red fat quarters...love his stuff! I've been following Jackie on Google Reader for a while now! I'm already on Jackie's mailing list! That's how I get into the most trouble! Loved reading your story! Thanks for a great blog! I could really do some damage with that Kaffe Fassett rainbow roll. Course that Kona fat quarter bundle isn't too shabby either!! I follow both of your blogs through google reader. Don't know what I would do without it! What a great giveaway. I did visit Jackie's blog and her online shop. She has a great blog and a great online shop. I intend to visit again soon. I signed up as a follower and for the newsletter. Thank you for introducing us. Thanks for sponsoring this give away for Jackie!! So nice of you. I just joined Jackie's mailing list! I love that Jackie's husband was so supportive of her quilting. and my favorite item in her shop is the pre cut 1930's tumblers...I can't wait for them to be back in stock so I can buy them up!! Enjoyed being introduced to Jackie! Can't wait to read through everything on her blog now. I've signed up as a Follower on Jackie's site! Love her Sweet Baby Dreams Quilt Kit. I am already a follower of Jackies. What a wonderful give away. I just love fabric!! Great giveaway! Beautiful fabrics! Please count me in! I'm already a follower of Jackies blog. If you would like to use content or photographs from my blog please respect my copyright and email me first! Thanks.